I know you’ve heard the expression “you are what you eat.” Normally it refers to ordinary food. If you eat healthy food, you’ll be healthy. If you eat unhealthy food, you’ll be unhealthy. If you eat too much of anything, it’s not good for you. Some of us, myself included, struggle with food issues for our whole lives. Between diabetes and chronic stomach problems, the list of things I’m not supposed to eat is longer than the list of things I should eat. Without getting into a biology lesson, we know that the food we eat is metabolized by our bodies and gives us energy and nutrients to keep us going, like fuel in a furnace. If we eat the wrong things, or too much of the right things, and we don’t exercise, what we don’t use is turned into fat. Burn more calories than you take in and you won’t have a weight problem. Eat a double cheeseburger then sit on the couch for four hours watching television, that double cheese will go right to your hips. Eat a salad then go for an hour walk, you’re on the right track. The funny thing is that I didn’t just make this up. We all know what it takes to live a healthy lifestyle, but some of us just refuse to do it. I guess it’s just human nature. To add to our frustration, there are some people who can eat everything in sight and never gain an ounce. I REALLY don’t like those people. But the topic today isn’t ordinary food. On this feast of Corpus Christi, the Body and Blood of Christ, I want to talk to you about spiritual food. Our bad eating habits may stay with us for a lifetime, but our partaking of the Eucharist will lead us to eternal life. Even skinny people have a place in heaven if they regularly receive Christ’s Body and Blood while they’re in a state of grace. 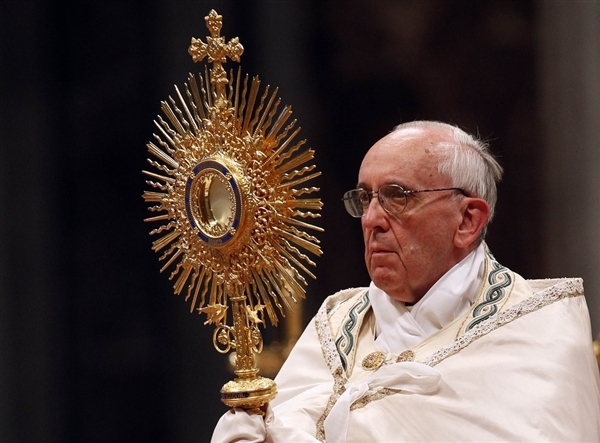 “The Church has received the Eucharist from Christ her Lord not as one gift—however precious—among many others, but as the gift par excellence, for it is the gift of himself, of his person in his sacred humanity, as well as the gift of his saving work. I was talking with some people the other evening and we were discussing how much more strict the Church used to be about receiving Christ’s Body and Blood. Most of us are old enough to remember that we were to fast, beginning at midnight, before receiving Communion. We can also remember when the first mass on Sunday was at 5:00 or 6:00 in the morning. There were no noon masses because no one wanted to go without food for twelve hours and Saturday afternoon mass was out of the question. Nowadays we only have to fast for one hour, and there are even exceptions to that short period, mainly for the elderly and the sick. Blessed John Paul II wrote in “Dominicae Cenae” (1980) of the problem of some people not being properly disposed to receive Holy Communion, even to the point of being in a state of serious mortal sin. He said, “In fact, what one finds most often is not so much a feeling of unworthiness as a certain lack of interior willingness, if one may use this expression, a lack of Eucharistic ‘hunger’ and ‘thirst,’ which is also a sign of lack of adequate sensitivity towards the great sacrament of love and a lack of understanding of its nature.” We must make a good faith effort to prepare ourselves properly to receive the Lord. Jesus gave us the Eucharist so that He could always be with us, not just spiritually, but also physically. I’m afraid that sometimes we take this gift for granted. Think about how you would react if Jesus showed up at your front door. You would be so humbled and excited that you wouldn’t know how to act. Of course, you’d invite Him in. You’d be in awe of his presence. You’d probably react like either Martha or Mary, either making sure He was comfortable in your home, fixing Him a snack and giving Him something to drink, getting out your finest china and crystal, and fussing over Him. Or, you’d want to sit with Him and listen to what He had to say. His physical presence would put you on your best behavior. In a few minutes, we’re going to have the opportunity to receive Him, not just in your presence, but within your own body. Just as you wouldn’t ask Him to sit on an uncomfortable chair and offer Him a beer without a glass in your home, we shouldn’t invite Him into our bodies, unless we’ve prepared ourselves to be a vessel for His Body and Blood. On the other hand, suppose your best friend invited you out to dinner at the finest restaurant in town. You would put on your best clothes, maybe get a haircut, and be on your best behavior for such a fine meal. After an hour or two, your dinner would be over and all you’d have left are the memories. The meal you’re about to receive here today will stay with you forever! According to the EWTN website, “Each time we receive Holy Communion we should try to be as devout and fervent as if it were the only Communion of our lives.” I think that’s good advice. What if we all approached the Altar as if this were the last time we’d ever receive Christ’s Body and Blood? There are people in Catholic churches all over the world who WILL receive communion today for the last time. Only God knows the day and time when we’ll be called home. If we knew that today was our last day on earth, I think we’d all look at things a little differently. Everything we do at mass leads up to the Eucharist. All the prayers, and the readings are designed to put us into the proper frame of mind. We ask God for forgiveness and mercy. We praise Him in the Gloria. We learn about Him in the readings and the homily. Representatives of the community bring the gifts of wine and bread to the altar for Father to consecrate. Notice that in today’s Gospel, Jesus doesn’t provide the fish and bread. He leaves that up to the Apostles. He didn’t have to do it that way. God, the Father, made food fall from heaven for the Hebrews in the desert. Jesus himself made wine out of water. But Jesus wanted the people to provide the food just like He wants you to bring up the bread and wind. We don’t use paper plates and styrophoam cups on the altar, we use sacred vessels because Christ’s Body and Blood are holy. We don’t keep the leftovers in a drawer or cabinet, we reserve them in a tabernacle, a sturdy, locked receptacle in a place of honor in the Church. If we spill His Sacred Blood, there are procedures that we follow to make sure there’s no desecration. Throughout the mass we’re reminded that we’re not worthy to receive such a great gift. “Lord I am not worthy that you should enter under my roof, but only say the word and my soul shall be healed.” Each of us knows our own hearts. We know our sins and our shortcomings. So does Jesus. As we prepare to celebrate His great gift, especially on this feast of His Body and Blood, lets all examine our consciences, be aware of our sins, be aware that we’re not worthy, and ask Him for His forgiveness.